~ Welcome to "Hermitage by the Sea"! 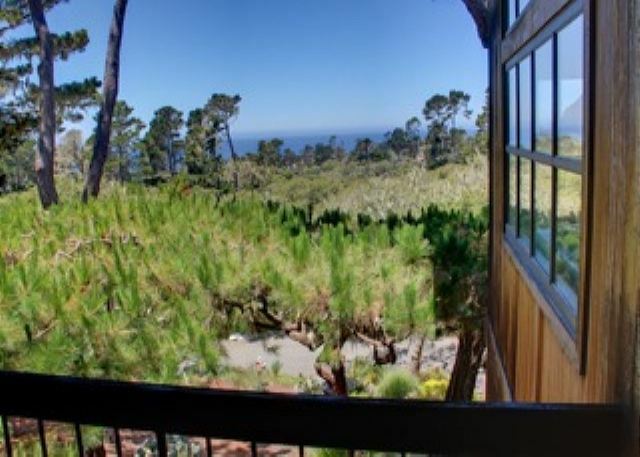 Stunning ocean view luxury home in exclusive gated Pebble Beach. Spacious. Incredible architecture. Walls of windows. ~ Great Room with fireplace looking into the new Chef's kitchen. ~ Long sets of Roof-Peak Skylights let in lots of light and the stars at night! 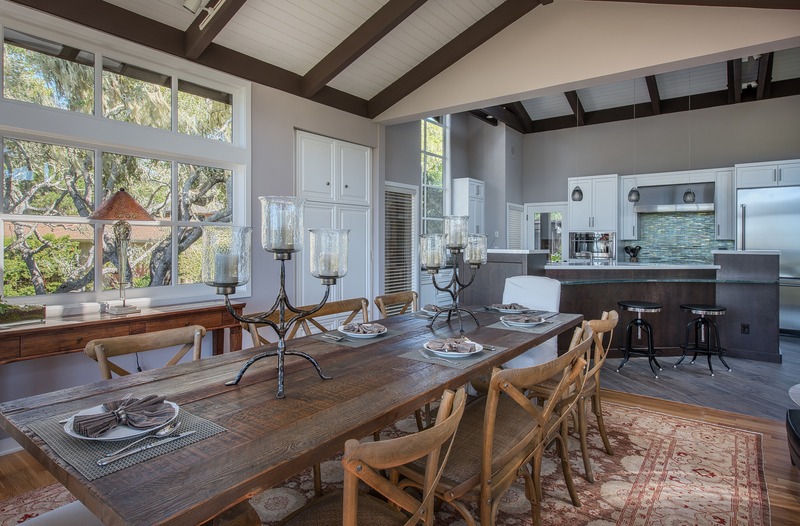 ~ Open Concept Living brings together Living, Kitchen and Eating Areas. 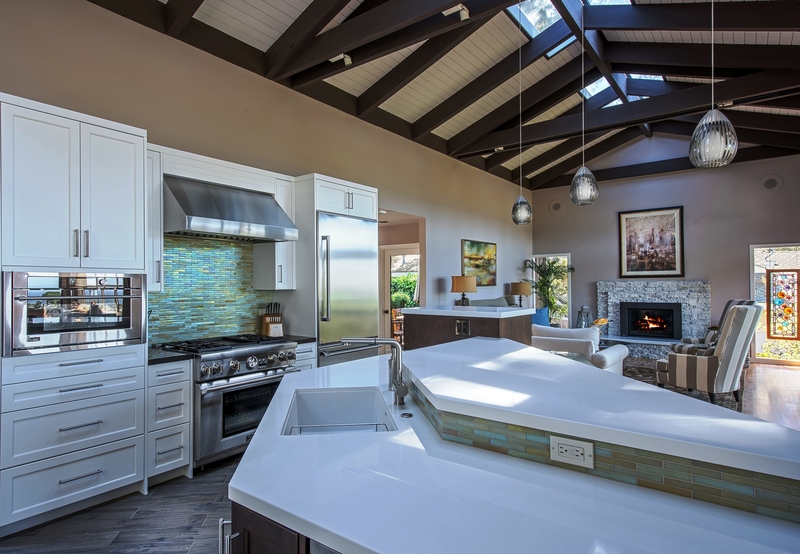 ~ Brand new Chef's gourmet kitchen! 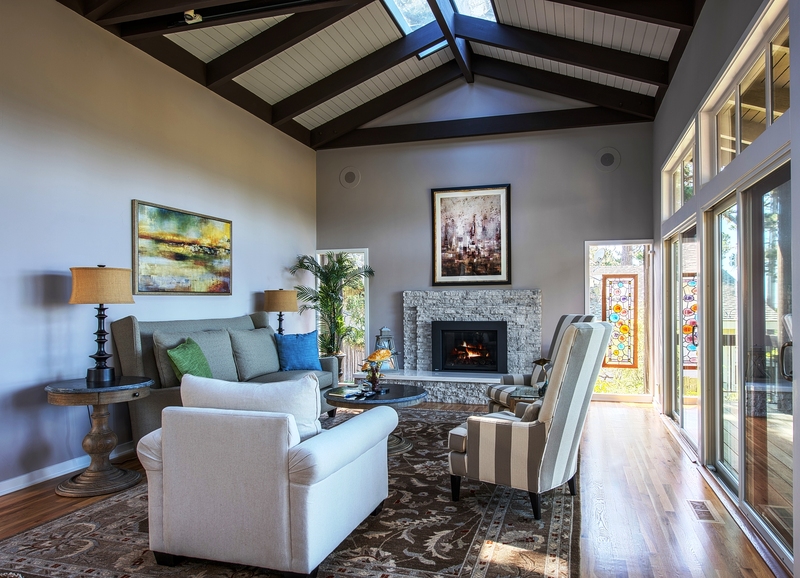 ~ Beautiful vaulted beamed ceilings and walls of windows fill this home with light and ocean views. ~ Stunning architectural design! ~ Ocean view dining for eight to ten guests. ~ You'll never want to leave this beautiful home! ~ Stunning interior design and luxurious furnishings! 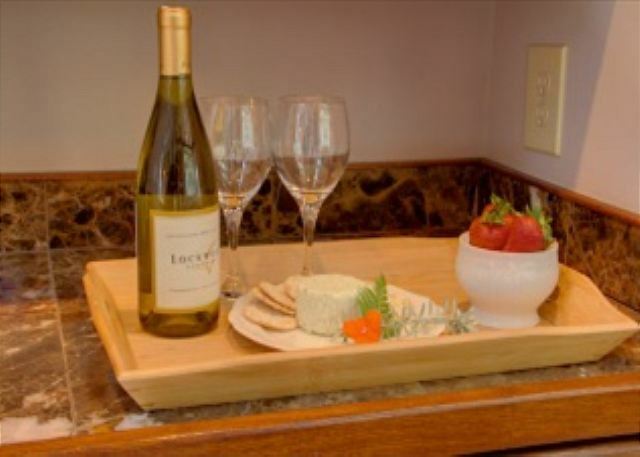 ~ Complementary wine and cheese to welcome you! ~ Master Suite with sea-foam blues and earth colors. ~ Master Bedroom with Flat Screen HDTV. ~ Master Bathroom. ~ Guest Room off the Family Room with Luxury Bedding. 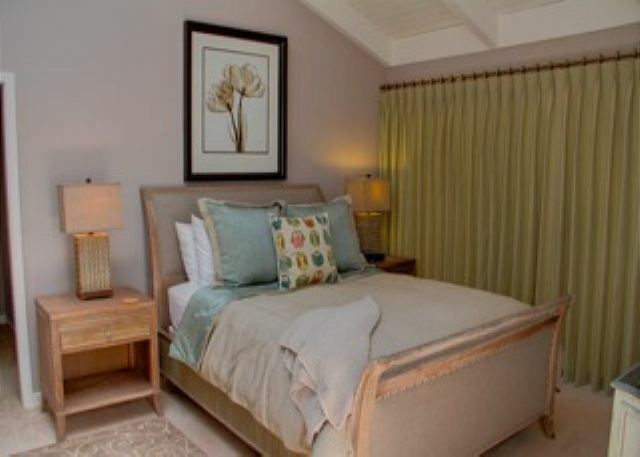 ~ Guest Room on upper floor looks onto landscaped gardens. 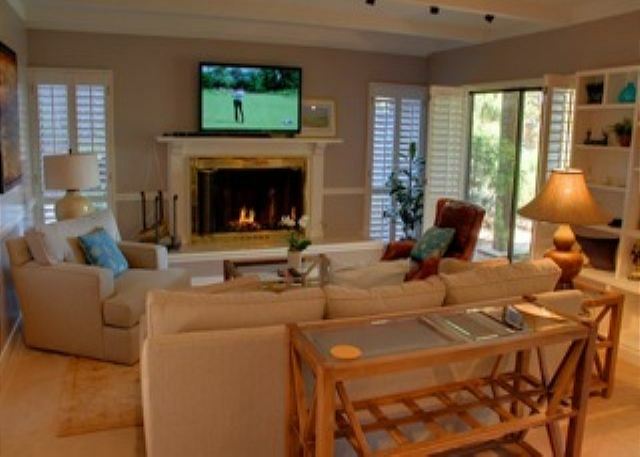 ~ Family Room with Fireplace and HDTV. ~ Wind protected outdoor eating area. ~ Beautiful ocean and nature views. ~ There is a living room and a separate family room on the lower floor that makes the home great for families. Two fireplaces and two flat screen HDTVs too. 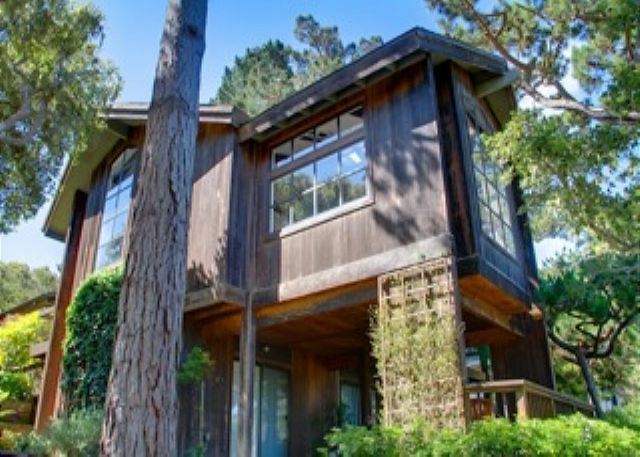 ~ Exterior of this Beautiful Pebble Beach home. ~ ~ Play a round at the world famous Pebble Beach Golf Course. ~ Take a drive on the famous 17 Mile Drive in Pebble Beach and see the Lone Cypress. ~ Walk or Bike for miles along the Recreation Trail from Pacific Grove to Monterey. Look for Sea Otters and Harbor Seals along the way! ~ Be sure to visit the World Famous Monterey Bay Aquarium! Welcome to “Hermitage by the Sea!” Home sleeps 6 adults. 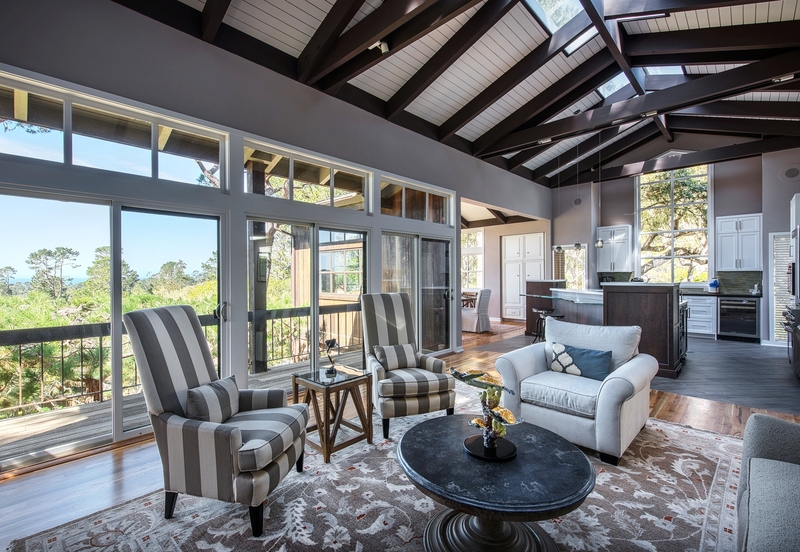 You'll begin to relax the moment you step inside the light-filled entryway and experience the soothing elegance and distant ocean views of this immaculate 2900 square feet, 3-bedroom, 3-bath home. 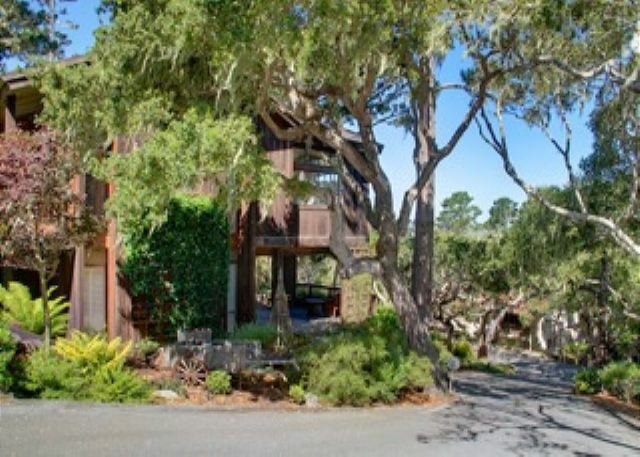 Tucked beneath moss-shrouded oaks and stately pines, this home is in the exclusive gated community of Pebble Beach. 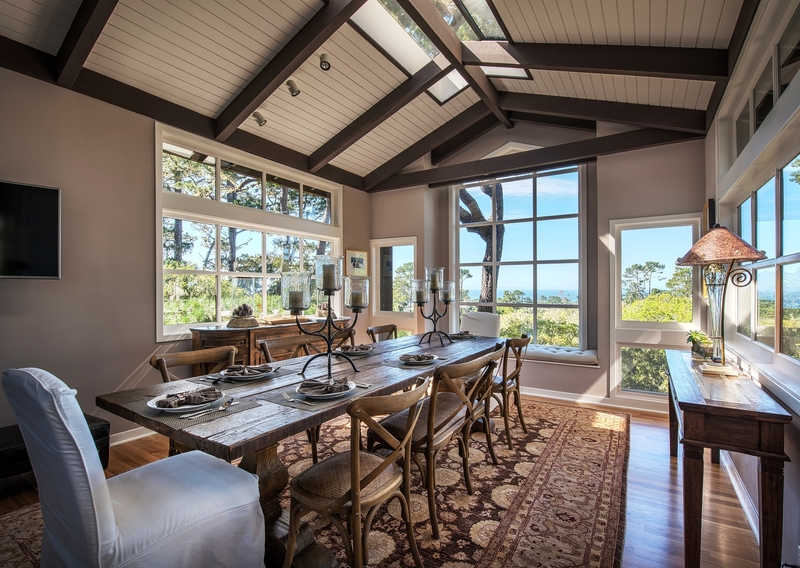 The second story comprises the main living space with distant views of the sparkling blue ocean over the treetops from the living and dining rooms. 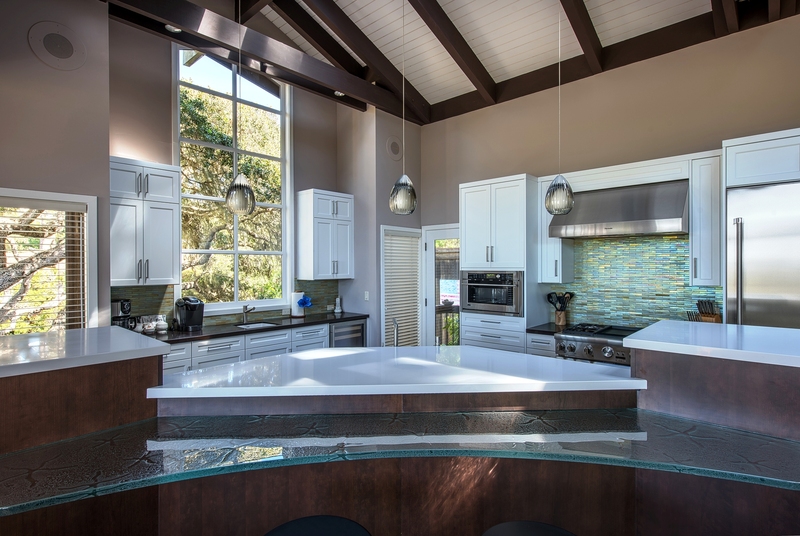 A bank of skylights on the high beamed ceilings bathes the living room, dining room and kitchen in soft coastal light. The spacious great room -- with its hardwood floors, area rugs, fashionable gray-and-white striped chairs, taupe high-backed sofa, off-white easy chair and whitewashed wood coffee table, offers an inviting setting for cocktails and conversation as you watch the sun dip behind the blue Pacific. Later, as the evening cools, you may want to light a fire in the gas fireplace and curl up with a book. A virtual wall of glass has sliding doors that open to a deck overlooking the front yard. The brand new, modern kitchen with its white quartz counter tops, high-end appliances and sleek contemporary cabinetry is a standout feature of the home. 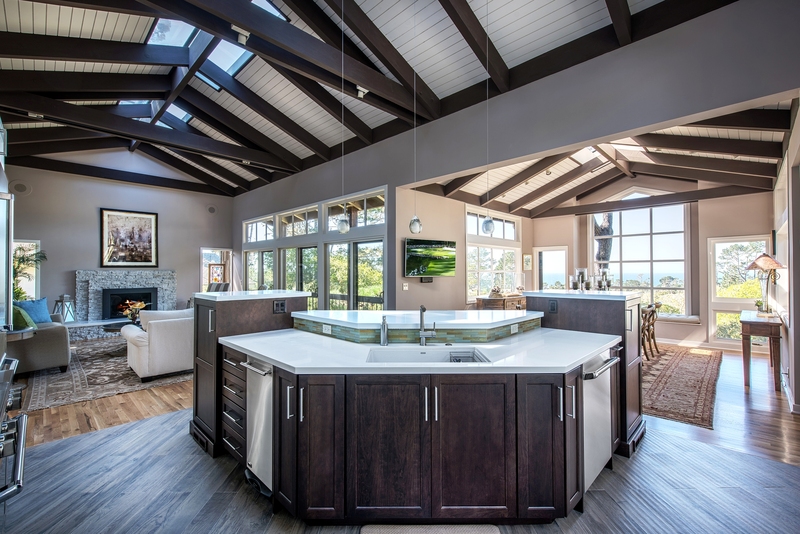 Stand at the sink and enjoy indoor-outdoor views and interact with others in the dining room, at the bar or in the living room. Whether you prefer to dine simply or prepare more elaborate gourmet meals, everything you need is provided, from top-of-the-line appliances to cookware and dishes. Entertain up to 10 in the dining room at a rectangular distressed-wood table ornamented with hurricane lamp candelabra. Relax with your morning coffee at a window seat that looks through a similar large peaked window to the ocean. Alternatively, you can prepare meals on a gas grill and dine outdoors on a private deck with a round wooden table and chairs for 4 while you enjoy the garden with its colorful potted plants, flowering shrubs and collection of wall-mounted birdhouses. The master bedroom has sliding glass doors that open to a patio, has a queen bed fitted with luxury linens and a beige coverlet, rattan lamps, distressed-wood end tables, dresser and a flat-screen TV. A large walk-in closet offers ample storage. 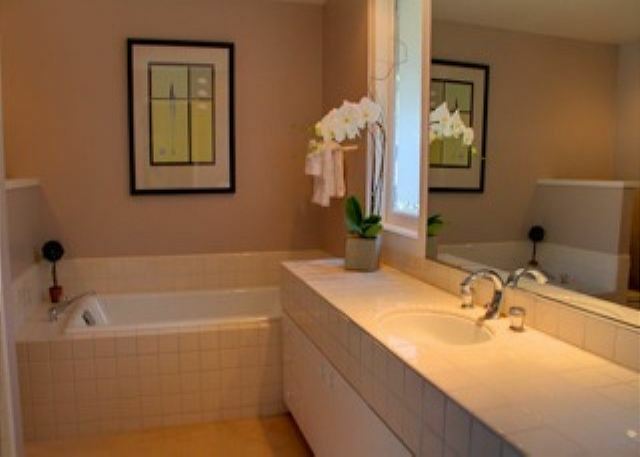 The master bath has a porcelain soaking tub and a separate large shower. A second smaller bedroom also has sliding glass doors opening to the patio, a wrought-iron queen bed, a whitewashed wood end table and a wrought-iron lamp. A full bath down the hall is tiled in white with a decorative checkerboard black and white tile strip and features a glass-enclosed shower. Relax, play games or watch movies in the downstairs family room with comfy couch and chairs and a 44” flat screen HDTV over the gas fireplace. There is also a desk if you are on a working vacation, a stainless steel sink and small refrigerator. On this lower level, a third bedroom has a queen bed with Mission-style headboard and chest of drawers. Sliding glass doors leading a to a patio where you can enjoy a morning cup of coffee at a small table and chair. A full bath has a tub shower. Adjacent is a laundry room with a washer and dryer. Guests Stayed in february 2017 ~ Reviewed on Homeaway ~ 5 out of 5 Stars! "Very nice property! We were very impressed with property, and enjoyed our stay." Guests Stayed in June 2015 ~ Reviewed on Homeaway ~ 5 out of 5 Stars! “A beautiful tree top experience! Our week at Hermitage by the Sea in June of 2015 was phenomenal! It exceeded our every expectation. Very large home with beautiful views. Each room designed with great care to bring elegance and comfort, the decor reflecting the seaside. The downstairs family room and bedroom was actually a home within a home. We were joined by our son, daughter in-law and the two grandchildren. It was really a perfect arrangement. Much to the delight of the grandchildren, we were within 5 minutes to the pristine beaches of 17 Mile Drive. Once again, a lovely home contributing to many wonderful memories." ~ J. Crabtree, Waterford Ca. 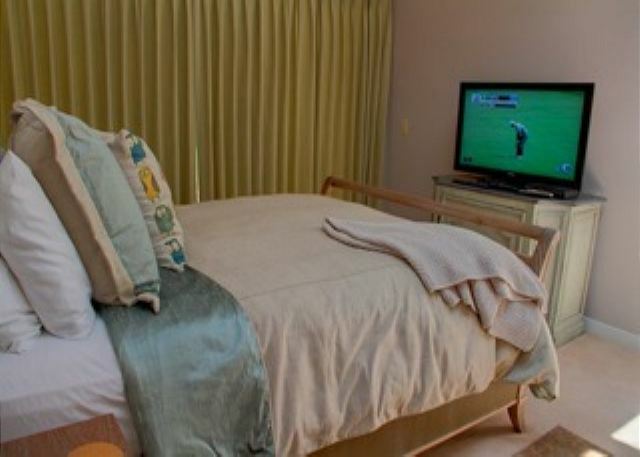 Note: There is a wall mounted flat screen TV in the Master Bedroom and an en suite bathroom featuring deep tub and separate shower and a very large dressing area. Note: There is a bathroom across the hall from Bedroom #2 that has a standing shower. Note: There is a full bath on this lower level with a shower-over-tub. There is also a family room area with fireplace and TV on this level along with separate access to an outdoor patio area.